When Bella + Canvas made the decision to break into the sport and outdoor apparel market, they did what they do best: source renewably, produce responsibly and distribute quality. All Sport is the branded athletic line Bella + Canvas introduced to meet the needs of the most active crowds...and those of us who enjoy wearing their clothes. To be fair, people of all shapes and sizes want clothes that are moisture-wicking, quick-drying, antimicrobial and sporty. Whether you are testing out an eye-catching laser camo All Sport M1009 Men's Sports T-Shirt for practice, or simply want to lounge around in a cozy All Sport W3006 Women's 1/4 Zip Lightweight Pullover on a cool day, Bella + Canvas still makes your choice functional, fun and fashion-forward. Same goes for business casual wear that helps you feel clean, sharp, and looking your best under pressure. 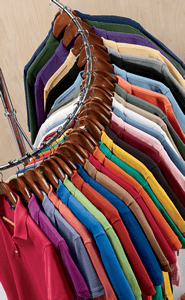 Polo shirts for men and women come in a wide variety of styles and sizes to stylishly add what you need to your closet. Youth apparel is made with the same high standards, but is sized for younger builds. Compression shirts and tanks are great for those tough gym workouts and outdoor events. Whatever the day holds, All Sport has a full offering of women's capris, racerback tank tops, mesh tanks, headbands, raglans, colorblock shirts, jackets, pullovers, sports bras, leggings and fleece available to help you seize it confidently. Bella + Canvas created their clothing for enhanced quality, lasting recovery, and great fit, in as many fabric blends and color choices you can dream up. So carpe diem, while your wallet appreciates you taking advantage of t-shirtwholesaler.com's combined order discounts, no matter how many different pieces, sizes, and brands you are getting. Just be sure to keep All Sport at the top of your list.